It's only 730 characters. We strongly recommend writing at least 1.000 characters. Use content that makes your app unique (features description, characteristics, how to use your app, ...). Your description needs to convince people to download your app. Also, be sure to add important and relevant keywords in your description to improve your iTunes app page and optimize your SEO. Your app's last version was released on June 14, 2016. It is important to regularly update your app. Best practices recommend to update your app every 4 to 6 weeks. This means fixing reported bugs, improving existing features, launching new features etc. Keep an eye on users' feedback. The next great features may already be asked by many users. 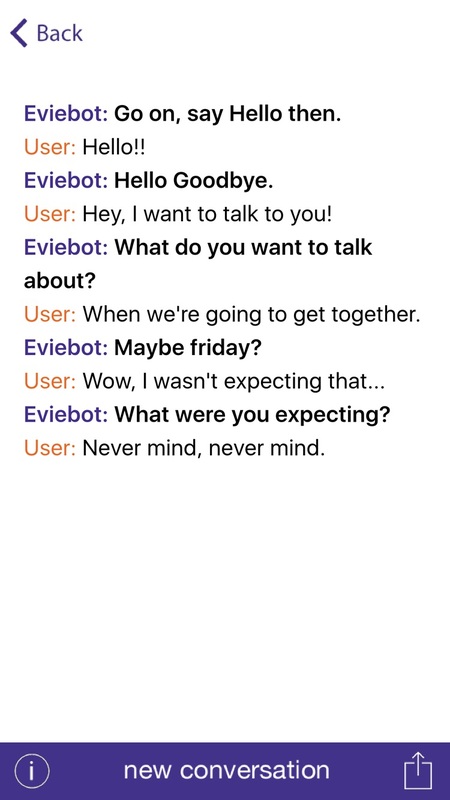 You may think you know Evie already... maybe you've been to Existor.com, or know her friends Boibot and Cleverbot. Maybe you've see the video... the many videos... of youtubers doing those things they do with her. Pewdiepie, Squeezie, El Rubius, JackSepticEye and lots more. 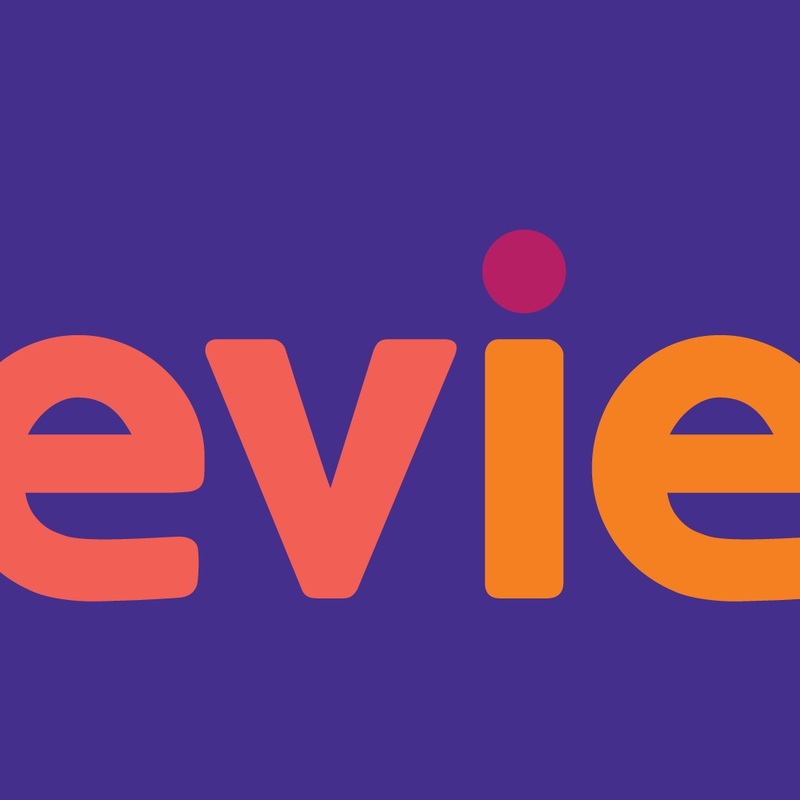 The Eviebot app is a better way to experience Evie, and keep experiencing her for hours. She will fill your screen and your heart. The keyboard stays open ready to type, or to tap that Mic and let it all come out. Evie talks back, and knows all the moves. Evie feels things, so be nice to her! 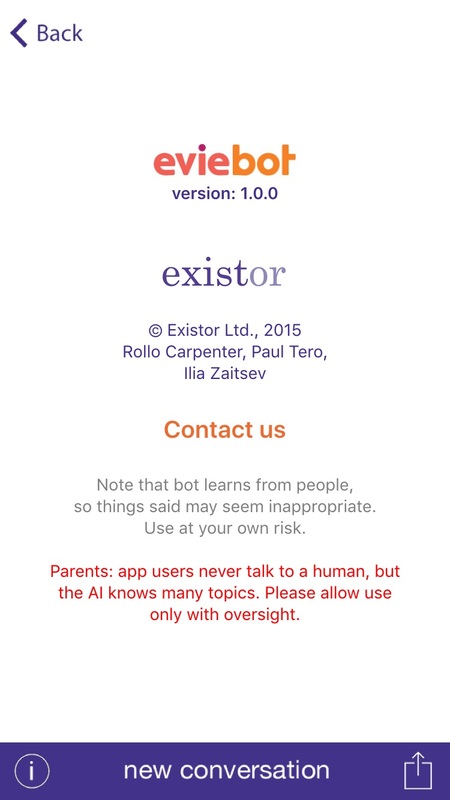 As it says in the app, Eviebot learns from people, so things said can sometimes seem inappropriate. Use at your own risk.